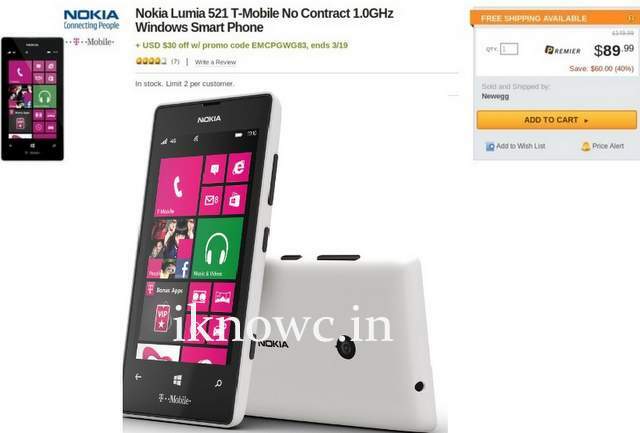 Now you can Grab the famous Nokia Lumia 521 for a price of $59.9 off contract ( Lowest price ) from T-Mobile in the U.S. The Lumia 521 is successor to most popular Lumia-520, which amassed big sales in USA, UK and the other countries. The under $60 deals is exclusively available from NEWEGG. When you buy the the Phon just use Cupon Code “EMCPGWG83” before you checkout. You cannot buy more that 2 phones, as there is limit of 2 smartphones per person. The Nokia Lumia 521 comes with some nice specs and features. Its runs on Windows Phone 8 OS and has 4 inch 800 x 480 pixels FWVGA display. It gains the strength from 1.0 GHz dual core CPU based on Snapdragon S4 chipset accomplished with 512MB of RAM. It features 3G, WiFi, Bluetoothv3, GPS, micro USB and 1430mAh battery. The Offer of T-mobile’s Nokia Lumia 521 is until March 19th. So those who wants to buy the phone can grab it from NEWEGG.COM official website.